A dietary natural supplement containing Cranberry extract useful for preventing bladder infections, also known as urinary tract infections or cystitis. Urinary tract disorders are caused by bacteria that travel from urethra up into the urinary bladder. Urinary tract infections can be quite painful. Women may feel like they need to urinate frequently and have a burning pain while urinating. In addition to respecting the proper hygienic rules and to drinking a lot of water, we can use some useful aid offered by nature: the phytotherapic beneficial properties of Cranberry extracts. 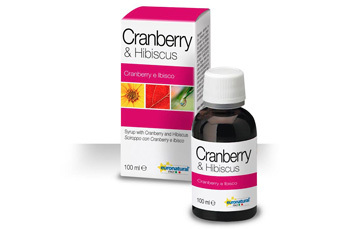 Thanks to the well-known properties of cranberry proanthocyanidins ( PAC ), useful to prevent bacteria adhesion on the urothelium, and in combination with Hibiscus sabdariffa extracts ( diuretic, antiseptic, and anti-inflammatory properties), the drink has been developed to provide an effective approach for the management of recurrent uncomplicated UTIs. It is an healthy combination used in a natural dietary supplement to fight the infections, without side effects and it’s proposed as a drug therapy adjuvant, after the acute attack, as well. The recommended dose is of 10 ml diluted in a glass of water. Remember that one of the most important rules to observe in these cases is to drink at least 1,5 -2 litres a day, in order to promote the urinary flow and the bacteria elimination.